All models except Sp To load or play CDs, the ignition switch must be in the ACCESSORY (I) or the ON(II) position. You operate the CD player with the same controls used for the radio. 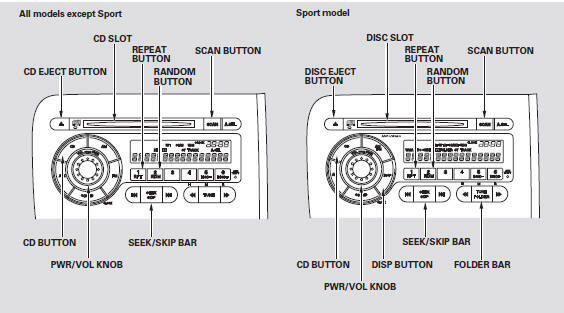 To select the CD player, press the CD button. The number of the track playing is shown in the display. The system will continuously play a CD until you change modes. Insert a CD about halfway into the CD slot. The drive will pull the CD in the rest of the way and begin to play it. When the system reaches the end of the disc, it will return to the beginning and play the disc again. To play the radio when a CD is playing, press the AM or FM button. Press the CD button again to switch back to the CD player. If you turn the system off while a CD is playing, either with the PWR/VOL knob or by turning off the ignition switch, the disc will stay in the drive. When you turn the system back on, the CD will begin playing where it left off. of the current track. Press it again to skip to the beginning of the previous track. the bar when the system reaches the point you want. To continuously replay a track, press and release the RPT button. You will see RPT in the display. Press it again to turn it off. This feature plays the tracks in random order. To activate random play, press and release the RDM button. You will see RDM in the display. Press it again to return to normal play. The scan function samples all the tracks on the disc in the order they are recorded on the CD. To activate it, press the SCAN button. You will get a 10 second sampling of each track on the CD. Press the SCAN button again to get out of the system and play the last track sampled. the CD. If you eject the CD, but do not remove it from the slot, the system will automatically reload the CD after 10 seconds and put it in pause mode. To begin playing, press the CD button. Press the AM or FM button to switch to the radio while a CD is playing. To play the CD, press the CD button. If you turn the system off while a disc is playing, either with the PWR/ VOL knob or by turning off the ignition switch, the disc will stay in the drive.When you turn the system back on, the disc will begin playing where it left off. You operate the disc player with the same controls used for the radio. To select the disc player, press the CD button. You will see ‘‘CD’’ in the display. The number of the track playing is shown in the display. The system will continuously play a disc until you change modes. The disc player can also play CD-Rs and CD-RWs compressed in CDTEXT, MP3, andWMA formats. When playing a disc in MP3 or WMA, you will see ‘‘MP3’’ or ‘‘WMA’’ in the display. You can see up to 99 folders, and select up to 255 tracks/files. Compatible with variable bit rate and multi-session. The specifications of the compatible WMA file are: Sampling frequency: 32/44.1/48 kHz Bit rate: 48/64/80/96/128/160/192 kbps Compatible with variable bit rate and multi-session. Insert the disc about halfway into the disc slot. The drive will pull the disc in the rest of the way and begin to play it. When the system reaches the end of the disc, it will return to the beginning and play the disc again. To play the AM/FMradio when a disc is playing, press the AM/FM button. Press the CD button again to switch back to the disc player. Each time you press the DISP button while playing a CD-TEXT, the display mode changes from album name, to track name, to artist name, and then to normal display. When playing a disc in MP3/WMA, the display mode changes from folder name, to file name, to artist tag, to album tag, to track tag, and then to normal display. If the title is too long, it will not show all at once. Press and hold the DISP button, and the rest of the title will show in the display. • When you insert a disc, and the system begins to play. • Each time a new track, file, or folder plays, other than in normal display mode. In MP3/WMA mode, use the FOLDER bar to select folders in the disc, and use the SEEK/SKIP bar to change files. To select a different folder, press the left or right side of the FOLDER bar. beginning of the current folder. Press it again to skip to the previous folder. This feature, when activated, replays all the files on the selected folder in the order they are compressed in MP3/WMA. Each time you press and release the RPT button, the mode changes from file repeat to folder repeat, then to normal playing. To activate random mode, press the RDM button repeatedly until you see RDM in the display. Press and release the RDM button again to return to normal play. The scan function samples all the tracks/files on the disc in the order they are recorded on the disc. To activate the scan feature, press the SCAN button. You will see SCAN in the display. You will get a 10 second sampling of each track on the disc. You will also see a track/file name in the display. Press and hold the SCAN button to get out of the system and play the last track sampled. This feature, when activated, samples the first file of each folder for 10 seconds. To activate the folder scan feature, press the SCAN button repeatedly until you see F-SCAN in the display. The folder name is also displayed. To hear the rest of the folder, press the SCAN button, within 10 seconds. If you do not, the system advances to the next folder, plays 10 seconds of it, and continues throughout the rest of the folder the same way. When the system samples the first file of all folders, F-SCAN is cancelled, and the system plays normally. the disc. If you eject the disc, but do not remove it from the slot, the system will automatically reload it after 10 seconds and put it in pause mode. To begin playing, press the CD button. Press the AM/FM button to switch to the radio while a disc is playing. Press the CD button to play the disc. For information on how to handle and protect compact discs.